Shamefaced, I looked at my feet, hugging Magic’s smooth neck against my cheek with one arm. We were both sweaty after what shouldn’t have been a tiring lesson. I’d set up a little course – an ascending oxer, spooky vertical, and two-stride combination of vertical to ascending oxer – which the Mutterer had abruptly turned into a bigger course. Bigger being 80-90cm (2’9″ to 3′). And I had trouble with it. Oh, Magic didn’t have any trouble. Magic believes in himself now; he knows he’ll make it. Of course, physically, it was absolutely no challenge for him. I’ve free jumped him 1.30m (about 4′) in a 15m ring and he popped straight over. So this little course was nothing for him. He hit his stride and drifted around, tucking up his knees and making every jump seem like nothing. I was the problem. (My own favourite mantra came back to bite me – “People don’t have horse problems. Horses have people problems). The most I can really say for myself is that when he’s jumping I stay out of his face and I usually get him good lines to the jumps. My problem is the approach. It always is, because somehow the last few strides leading up to an obstacle are so much worse than the obstacle itself. In riding as in life. Arwen, on whom I am fearless, likes to collect herself for the last two or three strides to get her hocks nicely under her for the jump. The bigger the jump, the more she likes to collect. That suits me just fine because it gives me more time and prevents scarily long takeoffs from happening too often. Magic doesn’t need to get his hocks under himself. Magic can jump from half a mile away and still clear these little jumps with plenty of room to spare. He likes to accelerate for the last couple of strides, which is a good thing. It allows him to jump straight out of his stride, gives him more momentum so that he uses less effort over the jump, lets him jump across the fence instead of up and down over it, saves time since he doesn’t need to slow down to jump, and helps him be quick off the ground. He doesn’t rush or pull – he just likes a few bigger strides for the takeoff. As soon as he lands he settles back into a quieter canter. The problem? I don’t let him do that. I want my little collected canter so that I have more time to hopefully not be scared. Magic, being his generous and willing self, tries to give me that slow canter, but he obviously doesn’t jump well out of it. And if I feel that our rhythm is off (which it is, because I made it off) I put my hands on his neck and look at the jump and luckily for me he stops. If he jumped while I was doing that I would probably eat mane. It’s become a pattern. He stops; annoyed with myself, I turn him around, listen to the Mutterer, keep my hands up and over he goes because Magic actually had no issues whatsoever with the jump. When I’m on my game, we’re awesome. He listens, he jumps like a pro, I’m balanced, we’re harmonious and effortless. But when my head is not in the right place, we’re a total mess. Today we lesson again. Today I will keep my hands up and my eyes on the prize. 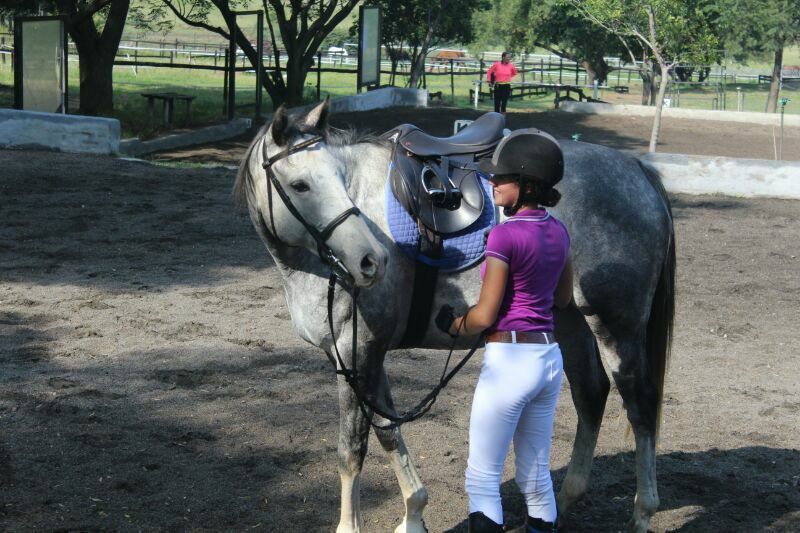 I have one of the most amazing horses in the world, and I believe in him. Now I just have to believe in myself – and yet not I, but Christ in me. So today I will look unto Jesus, the Author and Finisher of my faith, and lay aside every weight, and the sin that doth so easily beset me, and ride with patience for the joy that is set before me. Because Jesus endured the cross and is set down at the right hand of the throne of God, so I have nothing to fear. I believe in my amazing horse. And I believe in Christ. And Christ believes in me.